My favorite coin series is the U.S. Shield Nickel, minted 1866 to 1883. This will be a huge surprise to readers familiar with me (NOT!). Shield nickels were minted primarily in response to an extreme shortage of circulating coins. 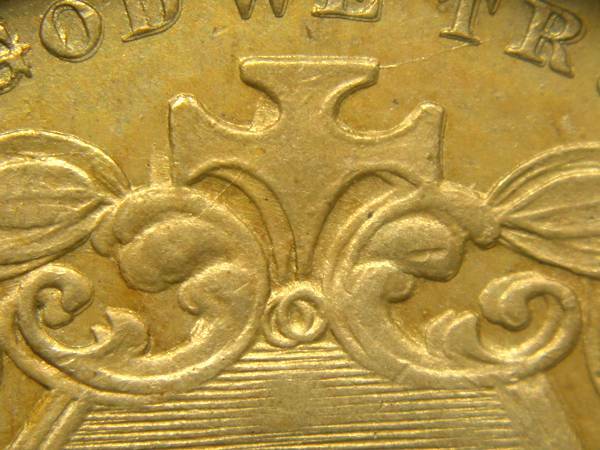 Gold and silver coinage had disappeared from circulation because their bullion value exceeded their face value. Postage stamp currency, fractional notes (shinplasters), and merchant tokens all proved unsatisfactory. In search of a solution, members of Congress were influenced by Joseph Wharton who advocated coinage made with nickel. Not coincidentally, Wharton owned a nickel mine and refinery. In 1865, Wharton's lobbying paid off when Congress approved a new three cent coin made of 25% nickel and 75% copper. Wharton's profits doubled in 1866 when Congress approved a new five cent coin of the same composition. The first reason to love shield nickels is that their origin is surrounded by political intrigue and probable corruption. The U.S. Mint had great difficulty minting the new shield nickel. The coin's composition was much harder than the existing copper, silver, and gold coins. The coin's diameter was too small - smaller than the subsequent Liberty nickels. These factors combined to require a much higher striking pressure than usual, which caused the dies to wear out much faster than usual. Generally a shield nickel die would last for 10,000 to 15,000 strikes - contrast this with almost 400,000 strikes per typical die for a Morgan dollar. Because the dies wore out quickly, the Mint had trouble producing shield nickels fast enough to meet the large quantities needed for commerce. Quality control went way down, and the haste with which the dies were prepared created many outstanding die varieties including doubled dies, repunched dates, and overdates. Liberal rations of rum may have contributed to poor quality control too!The second reason to love shield nickels is that they are a variety collectors paradise. There are so many varieties the collection can never be complete! Attached are photos of two examples of dramatic shield nickel varieties. 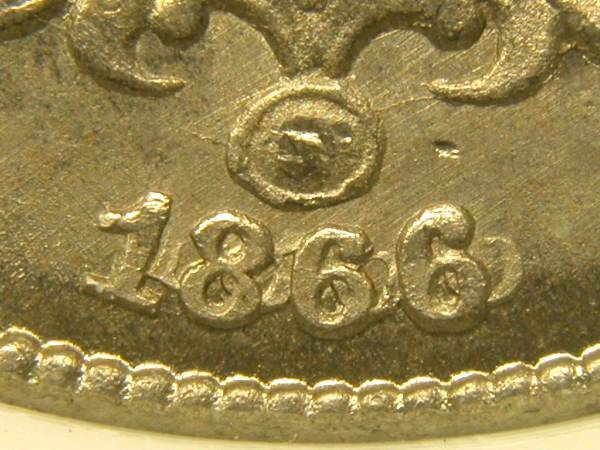 First is an 1866 repunched date with a very strong spread to the northeast, attributed Cherrypickers' Guide FS-001. Second is an 1873 Open 3 with a very strong doubled die obverse, attributed Cherrypickers' Guide FS-008.3. The doubling is unusual as shield nickels typically show a doubled annulet (the little circle below the cross near the top of the coin) in a north/south alignment rather than the east/west alignment seen on this coin. The final reason to love shield nickels is that they are an undercollected and underappreciated series, making them much easier on one's pocketbook! For example, the 1866 FS-001 pictured is an NGC 64 and was purchased for about $800. It is at least as dramatic as the 1916/1916 Buffalo nickel, and is much rarer than that Buffalo nickel. Yet a 1916/1916 Buffalo in MS-64 would cost many thousands of dollars. Hmmmm, why don't you all just forget what you just read and leave all those shield nickels to me? This page copyright © 2005 by Howard Spindel. All rights reserved.